One of the big attractions at Clockwork Alchemy is the Artists Gallery, a space devoted to steampunk gadgets, props, costumes, paintings and other artwork. This year’s gallery seemed to raise the bar from previous conventions. . .
Steampunk is a multi-faceted subculture — art, crafts, music, literature, cosplay, and more — and all were on display at Clockwork Alchemy 2019, held March 22-24 in Burlingame, California. Imagine an auto showroom run by the Mad Hatter, and that will give you an idea of the scene inside the Temple Art Lofts Gallery in Vallejo, California, where the Victorian fantasy explorers of Obtainium Works have set up shop. Pensacola’s Mardi Gras parade is a big regional attraction, drawing tens of thousands of spectators. 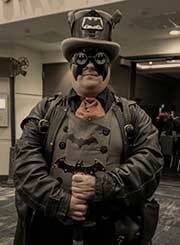 One krewe adopted steampunk as its theme, fabricating costumes and building an airship float. Krewe member Lew Attardo tells their story. Hundreds of revelers packed San Francisco’s Regency Ballroom for the Edwardian World’s Faire and Edwardian Ball, events that combined elements of a circus, music festival, art exhibition, and masquerade party, all with a quirky neo-vintage twist. As if the music, costumes, circus acts, and art installations weren’t enough, the Edwardian World’s Faire and Edwardian Ball featured a large, curated Vendor Bazaar with about 50 sellers of (mostly) handmade items. Steampunk was well represented. A fashion show, musical entertainment and the high-voltage antics of Professor Sparks were among the festivities at the Yule Steam Expo and Ball in Reno, Nevada. Thanks to Dr. Nathaniel Blackheart and Reshel A. Reid, we have a photo gallery. A Steam Man, a Time Machine and the dubious inventions of Prof. Phineas J. Flockmocker are among the highlights at the 36th Great Dickens Christmas Fair & Victorian Holiday Party, which finishes its 2018 run this weekend near San Francisco. . .